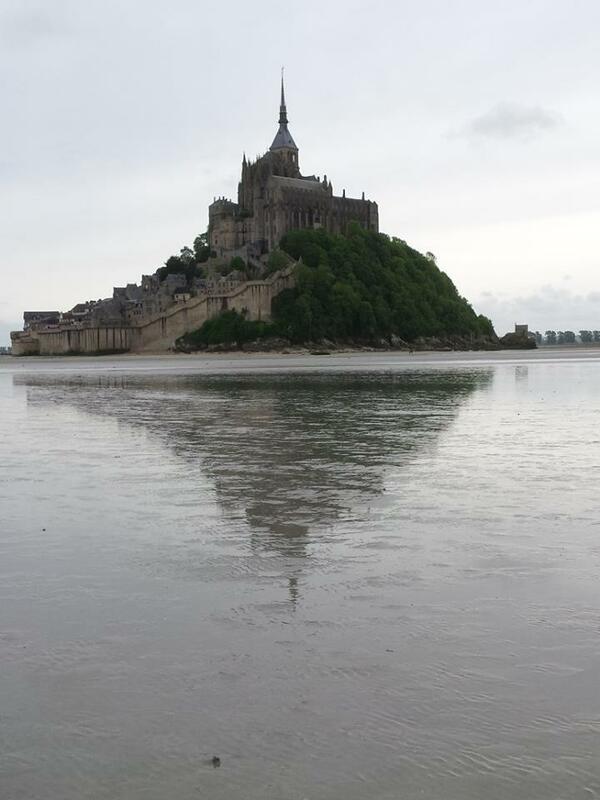 Just a few notes from my recent trip to western Normandy and eastern Brittany – a well-worn trail for me, with its highlights at Mont St Michel and Carnac. 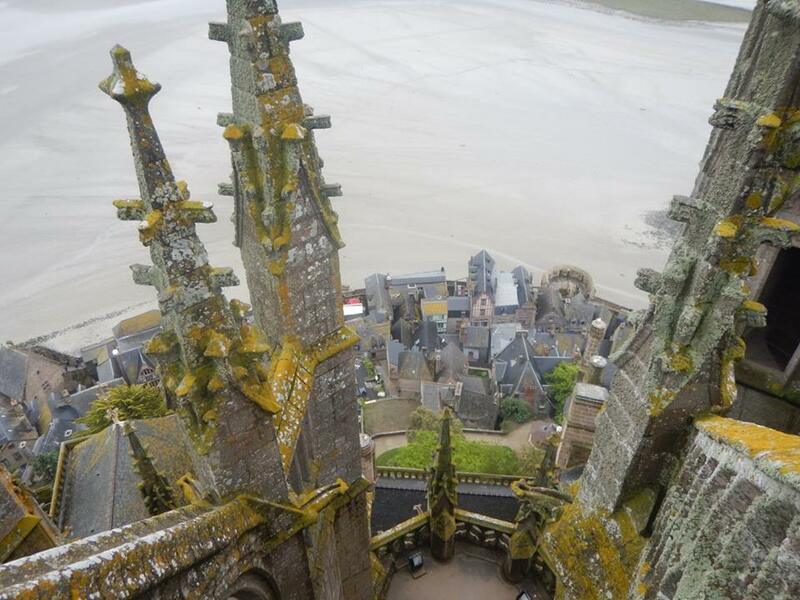 In particular, we were immensely privileged to be taken up through one of the flying buttresses to the roof level of the Abbey of Mont St Michel – something that’s only possible with a private guide that you’ve been working with for some years! So I’m afraid I can’t tell you who to contact. The Mémorial de Caen now includes galleries on the weapons of the Cold War and Berlin in the Cold War – you might expect it just to deal with D-Day and the Battle of Normandy, but it now covers everything from the causes of Word War II in the Versailles Treaties of 1918-19 up to its consequences in the 1950s and 1960s. Also new in 2017 is a Résistance & Collaboration gallery and a new film on the Battle of Normandy (in French and English versions). There are lots of small private museums in the villages near in D-Day beaches, which have their own quirky individual charm, with lots of recovered artefacts, but none offers anything like the detail and context of the Mémorial de Caen. It’s not cheap though, at almost €20 (€51 for a family pass). Over to the west, the Utah Beach Museum reopened in 2011; originally in a German bunker, it now has a state-of-the-art building for its displays, including a B-26 Marauder bomber in a custom-built hangar. But the landings on Utah Beach (and Gold, Sword and Juno) were relatively straightforward – Omaha will always be the main focus of attention. It’s worth mentioning that the city of Caen is planning to change from its unique and unreliable guided trolleybus system to a standard LRT tramway – the single central rail will be replaced by two running rails, so there will be construction chaos for quite a while once they get started. It opened in 2006, but I hadn’t come across the Mémorial des Reporters in Bayeux before – in a lovely park-like setting near the British Cemetery (rue de Verdun, off Bd Fabien Ware), it remembers the more than 2000 journalists killed in the line of duty since 1944 with a gravestone for each year. It’s getting more dangerous to be a war reporter – in 2015 110 were killed, at least 67 of them deliberately targeted because of their work, according to Reporters sans Frontieres. Across the road from the British Cemetery is the Bayeux Memorial, a classical portico bearing the names of 1,808 men of the Commonwealth and Empire who died in the Battle of Normandy and who have no known grave. Above is a Latin inscription that translates as ‘We, once conquered by William, have now set free the Conqueror’s native land’. Also in Bayeux, the new Villa Lara is a great hotel, with large stylish roosm and great service – although the first wi-fi log-in is unnecessarily complicated (and it’s not very fast); and every time you leave your bedroom it seems someone comes in and puts a sticker on the loose end of the loo roll – a bizarre obsession! But it’s great that they were able to get permission for a new building right in the centre of town (hidden away just off the main Rue St-Jean), and that they did such a good job. It’s not at all cheap, though. L’Angle St Laurent at 4 rue des Bouchers seems to still be the best restaurant in town – always fabulous. Down towards the Baie du Mont St Michel, the Auberge de Carolles is also much improved under its new management (though well out of the way for most tourists). I also have a new favourite crêperie in Dinan, Art-Bilig at 8 rue Ste-Claire – small, friendly and efficient, serving up excellent savoury brown galettes and white dessert crêpes, with local cider, of course. Speaking of restaurants – I don’t know whether this was coincidence, but in many places where I’d asked for a set menu for our group I was given a choice of cabillaud ou canard (cod or duck) – last year (2016) every menu in Britain seemed to offer arancini as starters (or they appeared as amuses-bouches while we were studying the menus), this year wild mushroom is everywhere – but that’s the UK, and I don’t expect that kind of faddiness in France, where chefs have the confidence to just do what they feel they do best, and the public expect that. But I can’t help wondering just what ‘wild’ mushrooms really are – I’m sure they’re not all authentically foraged from the fields. In Brittany, Léhon, 2km south of Dinan, reminded me a bit of Todmorden, with Incredible Edible-style plantings (which I also saw in Liège) – but rather than being a community-based free food scheme, these are educational (and very decorative) displays of the sorts of medicinal and edible plants that would have been grown by medieval monks. There’s always been a beautiful display in the cloister of the simple largely twelfth-century abbey, but now it’s expanded out onto the streets; the abbey garden is also open now, with newly planted apple trees (rare local varieties, I imagine) and bug hotels. It leads down to the river and the simple bridge, blown up by the Germans in 1944 (the blast also shattered the abbey’s stained glass) and rebuilt. Léhon is an older crossing point of the Rance, superseded by Dinan, just downstream, from the eleventh century, and now it’s just a quiet little village, overlooked by the remains of its castle – the towpath between Léhon and Dinan, closed by rockfall for at least half a dozen years, has now reopened and makes for a lovely walk or cycle ride. This interest in recreating monastic herb gardens is not new in France, and in fact I saw similar gardens at Fort La Latte and Poul-Fétan (where the whole village has been restored to its pre-industrial form). 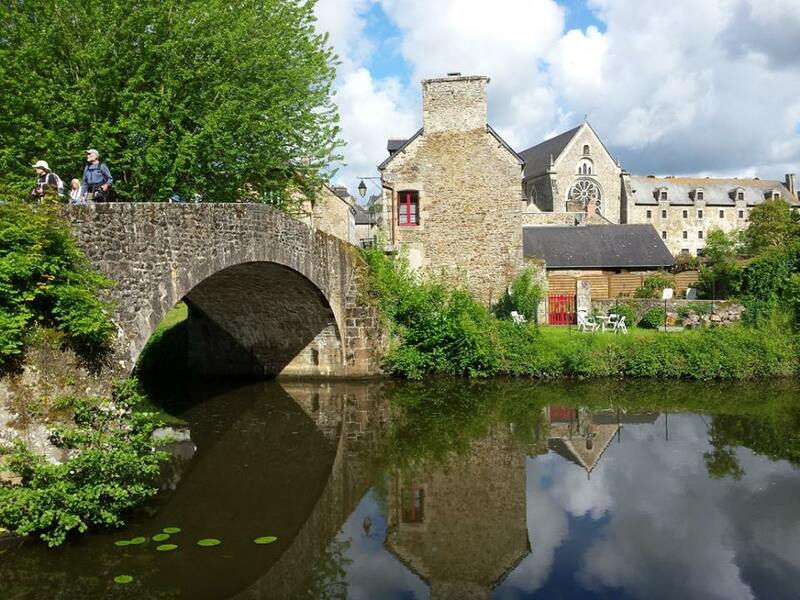 A little further west near Planguenoual, Herbarius is a garden of medicinal and edible plants that runs educational activities and grows plants to sell, aiming to preserve the biodiversity of the medieval ecosystem. Rennes is a large, unattractive and basically un-Breton sort of city now – although there are some lovely half-timbered buildings, and the modern Musée de Bretagne is excellent. When the new high-speed line from La Mans to Rennes opens in July 2017, with 20 trains a day bringing passengers from Paris in as little as 1hr 25min, they will be greeted by a building site. Work began in 2015 to build a second metro line and to create the shiney new EuroRennes interchange – both the main Place de la Gare, to the north, and the Parvis Sud, the convenient and less well-known southern entry, will be a mess until 2020, and the redevelopment of the area won’t be fully completed until 2027. But more importantly (it seems) the new shops in the station will open in 2018. In the west of Brittany, Brest and Quimper will each have 9 TGVs a day reaching Paris in 3hr 15min; Lorient has an entirely new station, which opened in May 2017 (also part of a local regeneration scheme). It’s all being promoted as Bretagne Grande-Vitesse, aiming to provide faster, more frequent and better integrated rail transport across the region. It’s worth mentioning that the Sud-Europe-Atlantique high-speed line from Tours to Bordeaux will also open on July 2, bringing Paris-Bordeaux journeys down by 75 minutes to just over two hours (London to Bordeaux will take under six hours, with a change of train in Lille or Paris). And France’s TGV services will all then be branded as inOui (a pun on inouï, meaning unheard of or amazing). Meanwhile, in 2020 Normandy will introduce its fleet of new double-deck trains (les Trains Normands) – paid for by the central government as part of the process of transferring unprofitable long-distance services from the SNCF to the regions (which already run local train and bus services under the TER (Transport Express Régional) brand. Normandy will now take responsibility for services from Paris to Caen/Cherbourg, Rouen/Le Havre, Trouville-Deauville, Granville and Serquigny, and from Caen to Le Mans and Tours, with the usual objective of boosting frequencies, speeds and connections. If that all sounds like good news, I found I was unable to collect my ticket (booked online) as usual from the ticket machines at Rennes station – I was told the system had changed and now I was expected to print it myself, or have it on a phone. Luckily I was able to find wifi (the usual SNCF station wifi was down, perhaps because of the construction works) and download the ticket. Still, this seems unnecessarily obstructive. I took the Brittany Ferries ship from Portsmouth to Ouistreham (15km north of Caen) and back – an excellent service, and there’s usually a direct bus connection from the port to Caen station. However on Sundays the service is poor – arriving late in the evening there’s no connection (and the one taxi loaded up and left, so I hitched into town just as it got dark), and returning on a public holiday (ie the Sunday timetable) the last bus to Ouistreham (not to the ferry terminal, but near enough) is at 1814 – the ferry leaves at 2300, so there’s plenty of time for dinner, and plenty of decent places to eat just south of the ferry terminal. Next Next post: Bangkok – street food still on the streets?